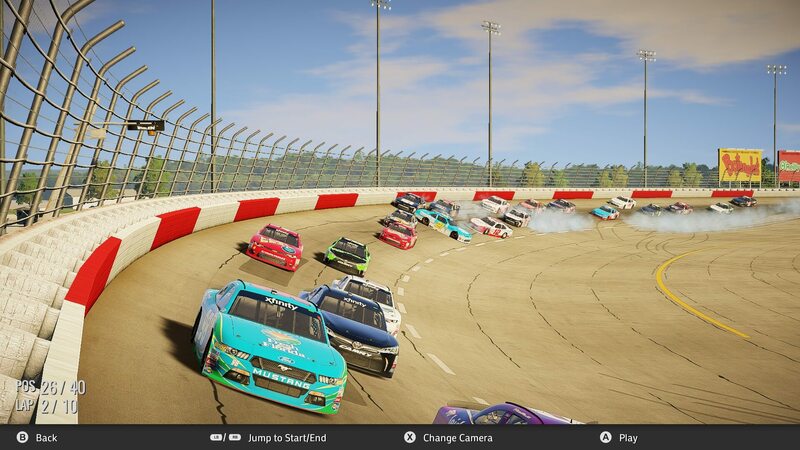 The opportunity to review NASCAR Heat 2 absolutely delighted me to no end. It was a privilege to get to take real NASCAR vehicles out onto sanctioned NASCAR tracks. My love for NASCAR started when I was just a tiny lug nut with a small, five-piece toolbox. Even at that early age, I knew a lot of the history of the sport. Originating in the Deep South and consisting mostly of moonshiners and bootleggers, the drivers would drive to the track, run the race, hope the car wasn’t too damaged, then drive it back home. Some of my earliest drawings were of NASCAR races, knowing all of the drivers, their numbers, and colors by heart. Back when kids actually played with toys (what a novel idea!) I would sand off my Hot Wheels cars and paint them like NASCAR vehicles. My first racing hero was Richard Petty. 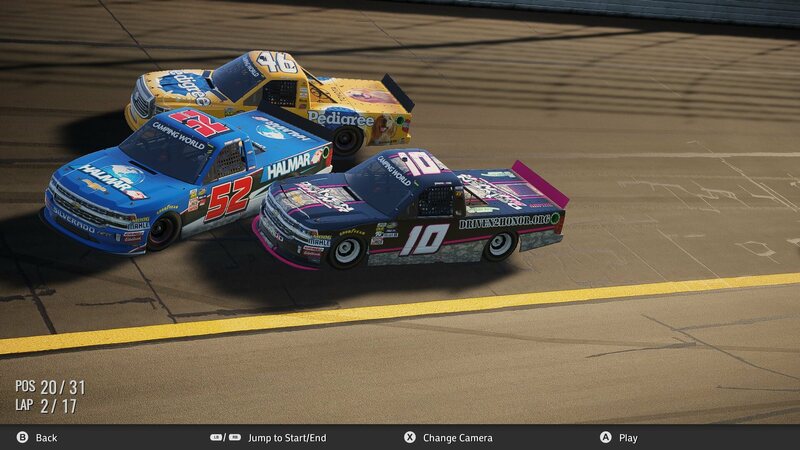 All three of the national NASCAR series are represented in NASCAR Heat 2: the NASCAR Monster Energy Series; the NASCAR XFINITY Series; and the NASCAR Camping World Truck Series. You can race at any track you wish in each series, as any driver you want, and/or create a custom driver with your own set of custom vehicles. There are Quick Races, Championships, Challenges, and a Career option, to name a few. The fastest way to get rolling is by choosing a Quick Race. Pick a Series, pick a driver, pick a track – Go! Some tracks will even have an Event Cycle – an example being Charlotte. You can run the Coca-Cola 600 at night or the Bank of America 500 during the day. Additionally, on the track selection screen is where you then have complete control over all of your preferred parameters. (These will save and carry over from race to race if you wish or you can change them each and every time). I will describe them all here as they are all relatively the same as with the other types of possible ways to partake in NASCAR Heat 2 (which I will definitely get to later). Say you want to run at Indianapolis, a two and a half mile oval, but you don’t have the time (or inclination) to put in all 160 laps for a 400-mile race. This where is the race length adjuster comes into play. You can battle on any track from between 2% (just a little taste) to 100% (the complete race experience). I did a lot of 13% races for this review, making my Indy race a more manageable 21 laps, to fit into my time frame. 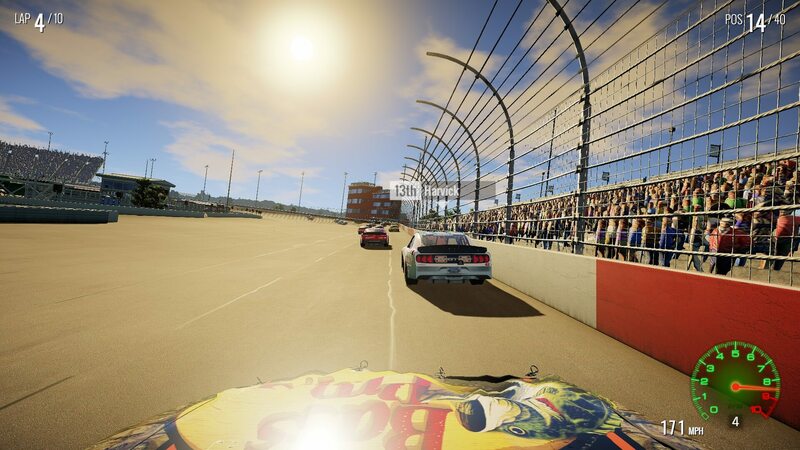 (note: no, you don’t have to do the math yourself, NASCAR Heat 2 does it all for you – no calculators needed). Then, at 13% and higher race lengths, you have the ability to choose whether you want a Single-Stage Race or a Three-Stage race. The final setting is the Quick Race Sessions. The options included are Practice, Quick Qualifying, Qualifying, and Race. This is all going to depend on your tastes as to how much practice you want before attacking a track with other drivers. Briefly, the setting can be: P/Q/R; P/QQ/R; Q/R; or Race Only. Or do we? Huge note here: if you choose to Race Only, without any qualifying, you will start every race in the last position (meaning 32nd in the Camping World Truck Series or 40th position in the XFINITY and Monster Energy series). I am a competitor, I like to at least have the possibility of a victory each race. The only way for that to happen, while running abbreviated races, is to qualify. With the game cranked up to even a reasonable level (as I have described my preferences above), I found it impossible to go from worst to first on even a 25% length race, much less a 7% or 13% one. Below the Quick Race Settings are the Mode settings. The Damage options are None, Light, and Full. [Yet another reason I prefer Stock Cars over open-wheel racers. Sorry F1 fans, but I love the ability to trade paint and not have a flimsy, mandatory-change-needing, front spoiler or bent push-rod suspension bar rule me out for the rest of a 500-mile confrontation]. With Stability Help ON, there is no “Always Use Custom Setups” toggle. When Stability Help is Off, then you have the choice to Always Use Custom Setups, or not. Finally, you will need to pick a manual or automatic transmission. While you are driving, there is a vast assortment of buttons to toggle to keep you informed about how you and your machine are faring during each race. There are three camera angles that I would call hood, cockpit, and follow. As always, whatever is the most comfortable for you – or even quickly switching between the three if that suits your style. The rearview mirror is easily on or off your screen. The Rearview Mirror is easily turned on or off. The more in-depth information is really the shining point though. If you want simply the Leaderboard, that is readily available. However, so is a breakdown of lap information that gives you the lap, leader, last time, best time, and record time. You have the ability to toggle the car status on and off which will tell you your estimated fuel left, engine wear, oil temp, and even how well individual body parts are holding up (Yes, if the front end and radiator are yellow to red, you will overheat). Finally, there is the status of the tires that lists wear percentage, as well as the temperatures for the inside, middle, and outside for each, individual tire [What the heck am I doing to that poor right-front?]. Having the ability to do all of these connected races are a huge bonus for me, as I always prefer ‘campaign’ style operations. It has a tremendous impact on the importance of each race, other than simply winning or not. Just like in the big leagues, consistency is key. While one 24th Place finish isn’t going to tank your playoff run, if you start stringing those together, it will greatly hurt your chance to be around at the end of the season. One race down, XFINITY Championship run. Another huge positive (for some people) is that you can start in the Monster Energy or XFINITY championship series if you choose to do so. As I previously noted, you can have all three championships going at the same time. 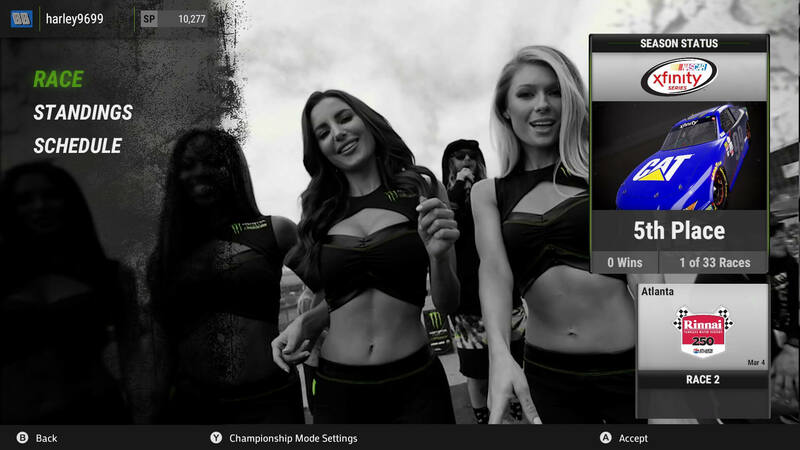 However, if you really want the NASCAR experience, from being a local racing icon to running with the big boys, Career mode is the one to decide on. For me, this is the meat-and-potatoes of NASCAR Heat 2. You are starting at the bottom and in the Camping World Truck Series. As the weeks go by, you may or may not get a hotseat ride offer for that week. Once you do, you will only get paid if you perform to their expectations (e.g. a Top-22 finish or better). Then, you will have to wait until the next offer comes by. (note: the weeks go by very quickly if you do not get to drive on a particular day) Remember, you are an untested, ultra-green rookie. These car owners are not going to be putting you behind the wheel of extremely high-priced machines until 1) you can prove that you are worthy to drive for them and 2) that you are not going to go out and tear up their expensive trucks. With some time and experience, you will then start to get job offers to actually join teams. To say anything more might be too spoilery. Needless to say though, you will have to work your way up and through the ranks before you can drive at Homestead-Miami in the Monster Energy series’ finale. 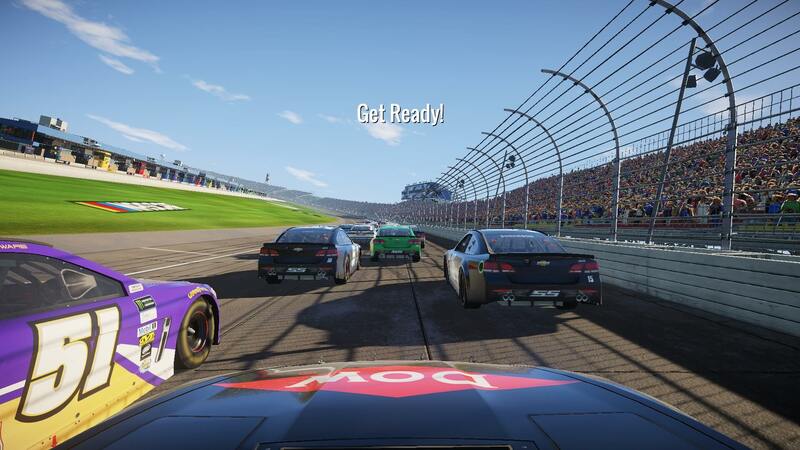 NASCAR Heat 2 is absolutely gorgeous, easily understandable, and optimized. Easy access means that this is not a simulation where you are having to worry about spoiler angle degrees, wind-tunnel test ribbons, and having to manually set camber, caster, and toe. As far as performance, I do not have a great computer by any means, but this is one of the few larger games that has not spun up my machine, then made it sweat and whine in order to look and work fantastically. The replays after a race are controllable and incredible as well. The corner camera even shakes as the beats are roaring through – just as it does on TV! Having said all of that, Heat 2 needs more customization, especially more decals and paint schemes at the very least. Coming from a very long background with games in the racing genre (including, but not limited to the Forza and Grid series), car customization seems to be the weaker point of this game (although I do know more is coming in separate DLCs). Then, like all great racing forays, you have a Spotter in your ear. Since there is no two-way communication, obviously he can only report on what is there, not what he thinks (or what you have told him) you will do next. He’s pretty good (correct about 98% of the time), if not a little too verbose at times. [When he’s excited and telling me, “Easy, easy, easy!”, it’s usually because I’m sticking my nose between two cars – maybe when I ‘accidentally’ shouldn’t be]. The absolute best parts of NASCAR Heat 2 are the personal, self-generating stories. I have way more anecdotes than the total number of races driven. Since I never was, nor ever will be, a NASCAR driver, a lot of ‘firsts’ happened for me. It is pulse-wrenching the first time I went three-wide at Bristol, four-wide at Daytona, and five-wide at Pocono (even the first race at the Tricky Triangle was pure heart-pounding fun). I quickly earned my Daytona Stripe (as well as Martinsville’s, Talladega’s—well, okay, I’ll admit I got a ‘stripe’ on every track). 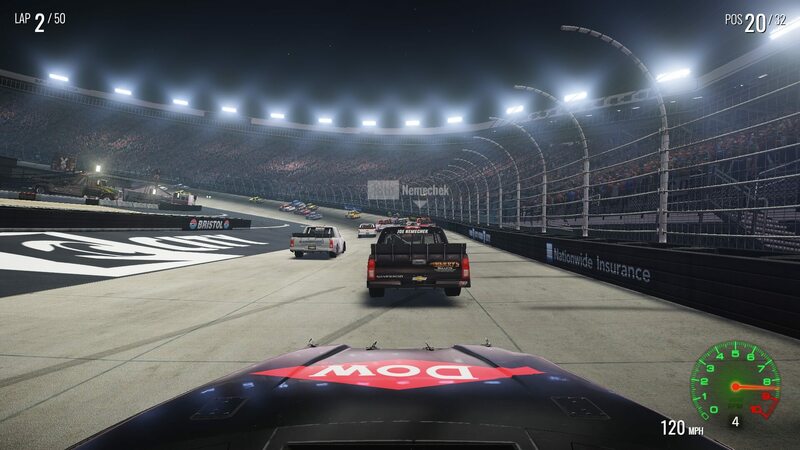 Plus, I found out the hard way that you cannot quite keep the throttle wide-open at Dover; and exactly how asymmetrical the oval is at Gateway. Also, make no mistake, the other drivers are every bit as aggressive as you are, while also mirroring your clean/maybe-not-so-nice tendencies. At least I’m in front of that mess back there! 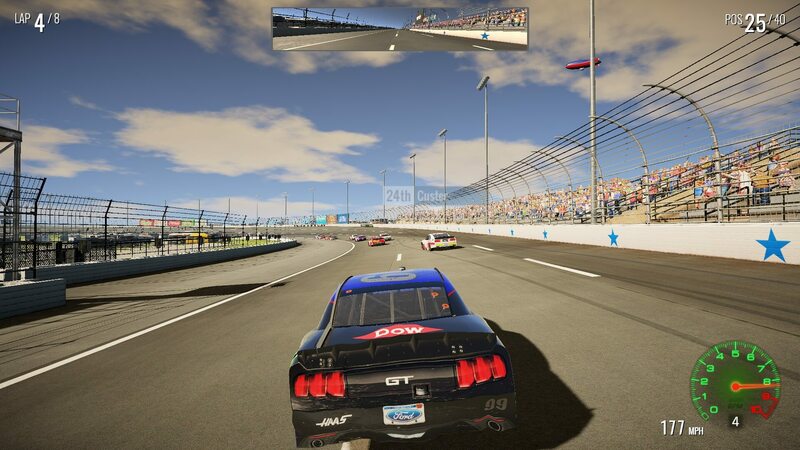 NASCAR Heat 2 is a phenomenal experience that I need to get back to – as quickly as possible. I am still in the early stages of my career, while also having three championships currently in-process. Plus, I knew my major weaknesses going in would be the road courses: Sonoma and Watkins Glen; Mid-Ohio and Road America for the Xfin bracket; and Canadian Tire for the trucks. These all are going to require me to put in some more practice time in order to be able to get anywhere near the top of the Leaderboards. Finally, you should definitely realize: you can’t go four-wide at Texas (or anywhere else) – unless the other drivers are already three-wide to begin with. “Just one more race, just one more race…”. A complimentary key was provided, for the purpose of this review, by game developer 704 Games Company.